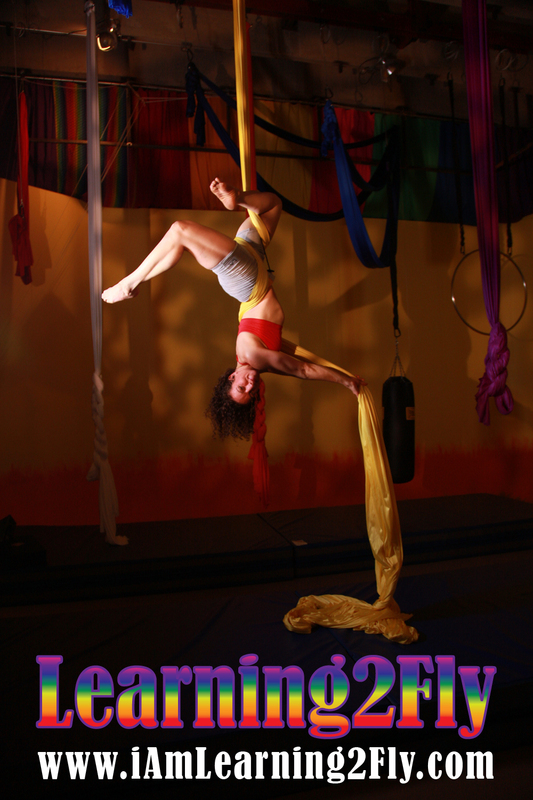 Three chances each week to get off the ground and see what aerial fitness is all about! This is the place to discover your inner aerial diva, or just get a great workout, or both because we aim to please at Learning2Fly. This class will introduce you to the very basics of climbing, how to do a proper foot lock, and other skills and drills to build your strength and flexibility. You’ll be introduced to the aerial vocabulary essential to your growth as an aerialist. Flight school was never so much fun until now. Bring your camera because you will do more than you ever expected, and all with a smile and the laughter and encouragement of your new friends. Learning2Fly is the best and cheapest therapy after a long day. Typically, you will be in this class for 8-12 weeks with a minimum of once a week commitment before you can move to the next level. This all depends on you. Your discipline and level of commitment is the only thing you need to excel.